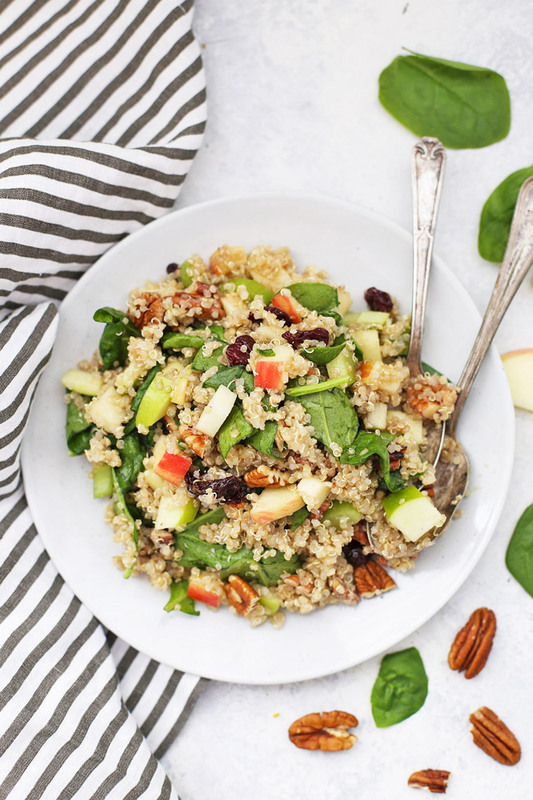 Powerhouse Quinoa Salad – This powerhouse quinoa salad is PACKED with nutrients and flavor. Perfect for days you need your lunch (or dinner) to go to bat for you! Originally posted May 2012. Post and photos updated + video added Sept. 2017. Post contains affiliate links which never ever changes any price you pay for a product. I talked about this a bit in my meal planning post, but one of the easiest ways I know to eat well is to have a few things pre-made (or the components prepped) ahead of time. I don’t hit every breakfast, lunch, dinner, and snack throughout the week with meal prep, but I’ve found that picking just a few things to focus on frees up time and energy for other work during the week. I often work on prepping my breakfasts and lunches. This might mean cutting up veggies for salad fixings, or making a yummy dip that I can use with veggies or to make wraps or sandwiches. One of my FAVORITE things to have on hand is an awesome quinoa salad. They store like a dream and are substantial enough to keep me full and satisfied. This powerhouse quinoa salad is no exception. 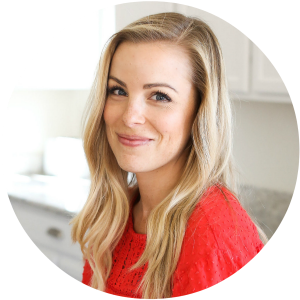 It truly is a nutrient powerhouse–packed with nutrient-dense superfoods and plenty of goodies to keep me going! Plus, it’s gluten free and vegan, to boot! I cook a simple batch of quinoa (this is my favorite way to cook quinoa), then just start adding goodies. This one has kind of a fall slant, with a few kinds of apples and that cozy dressing to tie things together. For extra color, you can use red quinoa or tri-color quinoa. I used white this time. They’re all whole grain and absolutely delicious. The texture contrast here is amazing. 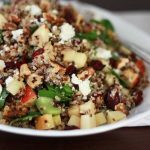 The quinoa is tender and light, the nuts nice and toasty, the apples and celery fresh and crisp, and all that goodness is brought together by a little balsamic dressing. It makes for a hearty, satisfying lunch or light dinner or a terrific side dish for potlucks and parties. Plus, you can see from the notes section, there are SO many ways to change it up! How to store it… If you’re making this ahead of time, it’ll keep fully assembled for about 3-4 days. The apples and spinach will start to lose a little texture after that. To prevent this, you can make them mason jar style, where you pour dressing into the bottom of the jar, then the apples/celery, quinoa, greens, cranberries, and nuts. Love that dressing. I love the dressing in this salad. It’s got so much flavor and really complements the other flavors of the salad. This is just enough dressing to coat the salad without being soggy. If you like more dressing, feel free to double the dressing! Prepare the quinoa. Rinse quinoa in a fine mesh sieve. Add rinsed quinoa and 3 cups of water to a large saucepan. Bring to a boil over medium heat and boil 5 minutes. Turn off heat and let steam 15 minutes, or until all the water is absorbed. Let cool. 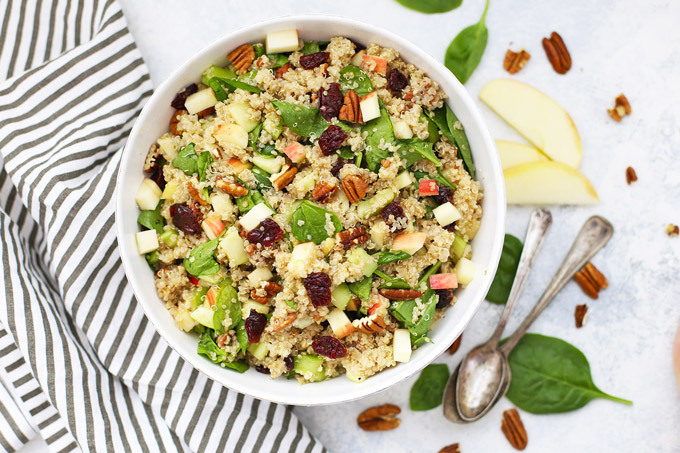 In a large bowl, toss quinoa, apples, celery, spinach leaves, cranberries, walnuts, and cheese. In a small bowl, whisk together mustard, honey, vinegar, olive oil, salt and pepper. Pour over quinoa salad mixture and toss to coat. Taste and add additional salt and pepper as desired. Its crazy how close this is to what I made for dinner a few nights ago. I have so much love for Quinoa right now, in the last few weeks we have had quinoa salads, curried quinoa, and quinoa fritters (my current fave I even found time to post the recipe). Hmm, I bet this salad would work well with couscous too. I love this idea! and I love WARM salads, there is really nothing better!! I love quinoa! I am all about a quinoa salad. I love everything that you added to this one too. Sounds amazing! 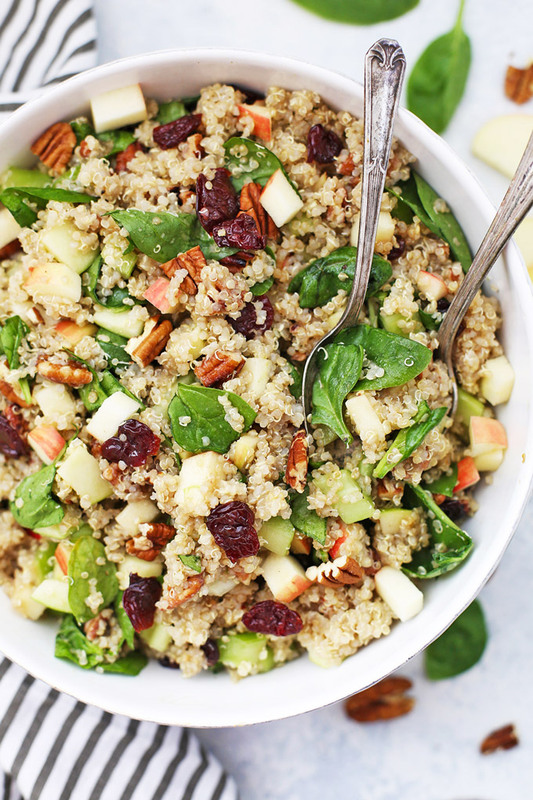 Another great way to use quinoa! I love finding new recipes for quinoa! 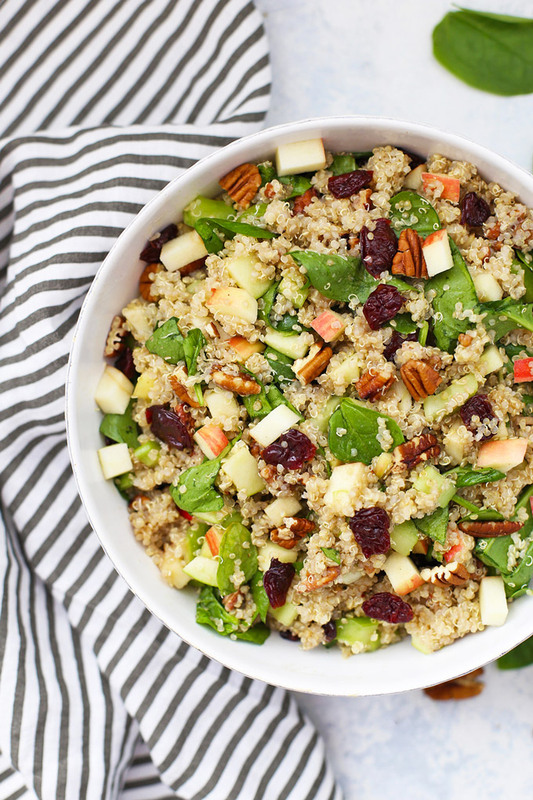 I’ve been eating quinoa salads for lunch a lot lately, so I’m pinning this to try soon. i make a quinoa salad that’s really similar to this and it’s so delicious! I finally had a chance to make this (having a baby between now and my previous comment really slowed down my cooking) and it’s wonderful! I brought it for lunch to work all week and enjoyed every bite. Thanks for sharing it! Quick question – can I make this in advance!? I would really love to make this to have on hand for lunches for a few days. Can I put the dressing on and then store it, or should I add it write before serving? Yes! Absolutely! You can assemble the whole thing (dressing and all) and pop it in the fridge, ready to go! If you like, you can keep the nuts and cheese out (if using) and sprinkle that on right before serving. I think that gives you the best texture 🙂 Hope that helps! Perfect! Thank you for your quick response! I just came across your site today, but I’m sure I’ll be back. I love your philosophy on food! and am also all about salads these days. I know this is an old post – but I’m so thankful for it! This salad is AMAZING! I love quinoa based salads because they are so filling. This is probably my favourite one so far! DELICIOUS! Thank you SO much Giselle! I love quinoa salads! This looks so good! Such a good use of common pantry ingredients! Delicious!!! Hubby loved it too! I could drink the dressing! 😉 I didn’t have spinach on hand, so I used some kale instead. Worked perfectly. RIGHT?! The dressing is tough to beat! I’m so glad you enjoyed it as much as we do. Made this for Book Club. I substituted kale for the spinach. It is delicious!! I hope there’s some leftover as I’ll be having this for lunch tomorrow with chicken!